When one of my favorite authors, Katee Robert, recommended this book I knew I was going to be in for a wild ride. 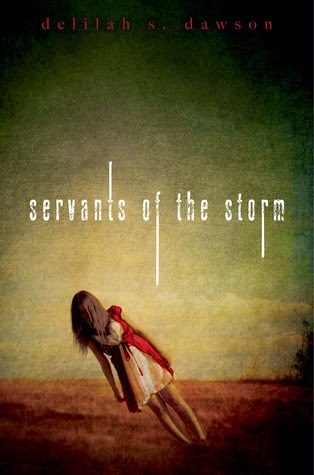 From the start SERVANTS OF THE STORM is atmospheric and intense. It's everything I love in a good horror story and a lot of things I love in any story so even though there were a few times when I was getting frustrated with the lack of answers and pacing I wound up loving it. Firstly, I feel like there is a lack of racial diversity in fiction so I was very excited that Dovey and Carly were biracial and black, respectively. Seriously, that alone would have been awesome but I also feel like a lot of YA focuses on romantic love and Dawson didn't do that. Sure, there's a bit of a thing with a pair of characters where one might almost call it a love triangle but while it helps the plot move along it also isn't essential to the story. Instead, SOTS is all about a young girl trying to find/save her best friend and the kind of love between friends that will drive them to risk their own lives. I won't spoil anything but I was pretty moved by a particular element of that and found myself thinking I needed to find more books with this theme. Further, the world that Dawson has built is absolutely terrifying. The kind that will have you thinking "nope nope nope not that world" if anyone ever asks you if you'd want to live in it. She manages to take a place known for being a charming Southern treasure and rips off its flesh to expose monstrous guts and rotten bones. It takes a very, very dark film or book to make me want to sleep with the lights on and SOTS almost had me there. And then there is the ending... sweet baby kittens that ending. THAT ending!!! I haven't loved an ending this much in years. If you are looking for something spooky and dark to read around Halloween this is a perfect choice. I'd previously read only Dawson's entry in the Carniepunk anthology and after this I've moved her other books up my wishlist. I will definitely be watching her releases with anticipation from now on.